The Audi display at the Guangzhou auto show in China, last month. Audi, needs the country to help meet a target of surpassing BMW as the global No. 1 luxury brand. BEIJING -- China may overtake Germany as the world's second-largest market for luxury cars behind the United States this year, fueled by demand for the two brands that are fighting for leadership in the segment: BMW and Audi. The number of luxury cars sold in China may climb 39 percent to 939,000 in 2011, exceeding the 914,000 vehicles that will probably be delivered in Germany, said Jenny Gu, a Shanghai- based analyst at research firm LMC Automotive. Sales in China will probably increase 16 percent next year, outpacing Germany's 4.4 percent growth, she said. The largest luxury carmakers -- BMW AG, Daimler AG's Mercedes-Benz and Volkswagen AG's Audi -- are counting on China and the U.S. market to fuel expansion next year as economists at Barclays Plc estimate Europe may be in recession through the first half of 2012. The German car market, Europe's largest, probably won't grow next year as the debt crisis saps consumer confidence, auto-industry association VDA said this month. The growing affluence of Chinese consumers has fueled demand for luxury goods, though that market has cooled. "Luxury car demand is still on the rise in China with low penetration rates," said LMC's Gu. "Sales of such cars in developed markets like Germany fluctuate together with the economic cycle." Audi, the luxury-car sales leader in China, needs the country to help meet a target of surpassing BMW as the global No. 1 in 2015. Audi surpassed Daimler this year as the second-largest luxury-car maker. All three luxury-auto makers posted record November sales in China. Audi soared 69 percent over last year, BMW rose 9.8 percent and Mercedes gained 24 percent. Industry-wide sales in Europe of all cars last month fell 3 percent. 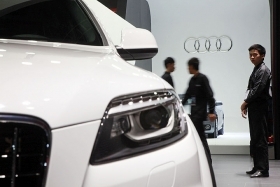 Audi's 11-month sales in China have advanced 35 percent to 283,600. BMW through November has climbed 40 percent to 200,699, while Mercedes has gained 31 percent to 170,112. To cope with demand growth in China, BMW, Daimler and Audi plan to limit holiday breaks for the second year in a row. BMW and Daimler's Mercedes-Benz will shut most plants for just one week between Christmas and New Year's Day, while Audi will close European plants for two weeks, the carmakers said earlier this month. The automakers lengthened year-end breaks for many workers to as long as three weeks in 2009 because of lower sales. The LMC estimates, which track sales of 21 luxury brands ranging from Audi to Bentley, are preliminary and subject to change, Gu said. LMC recently raised its 2012 estimates for China sales to 1.09 million and lowered its forecast for Germany to 954,000, she said. China overtook the U.S. in terms of overall car sales in 2009. In the United States, the largest luxury-car market, deliveries will probably climb 18 percent to 1.65 million units as demand recovers from the projected 1.4 percent growth in 2011, Gu said. There is a two-month waiting list for the BMW 5 series long-wheelbase sedan in China, Olaf Kastner, chief executive officer of BMW's Chinese venture, Brilliance China Automotive Holdings Ltd., said in a Dec. 1 interview. "The premium car industry has enjoyed over the past two to three years an amazing growth," said Kastner. "We still, in the premium segment, will see a higher growth rate than the mass segment" for next year. Demand for luxury items in China will reach a record 88.8 billion yuan ($14 billion) in 2011, rising 82 percent since 2005, according to Euromonitor International estimates. Still, sales are slowing as the Chinese economy grows less quickly. The government this year raised down-payment and mortgage requirements and imposed home purchase restrictions in 40 cities, resulting in home prices last month posting their worst performance of the year. Mercedes-Benz and BMW dealers increased discounts on some models in China last month, according to data from researcher China Auto Market. Mercedes boosted discounts in the U.S. by 39 percent last month, while BMW increased its incentives 25 percent, according to researcher Autodata Corp. The German automakers are vying to succeed Toyota's Lexus as the U.S. luxury auto-sales leader. Toyota's output this year has been limited by natural disasters that disrupted the supply of parts.